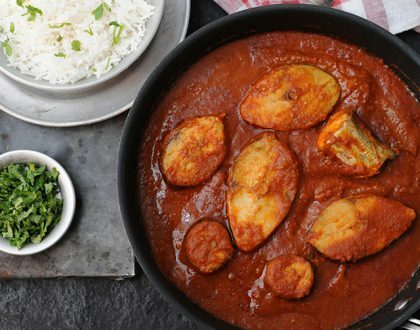 Delicious and easy curry made using hard boiled eggs that are simmered in a spicy onion and tomato gravy. 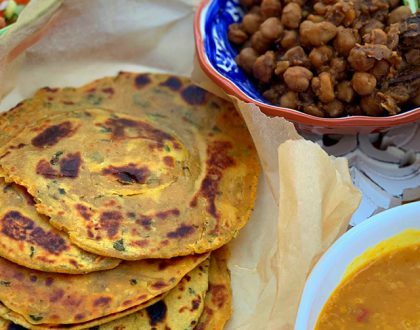 This family recipe is inspired by the Dhaba’s in Northern India and makes an easy weeknight dinner. It also pairs beautifully with any Indian flatbread and rice. Health Hack: Eggs are a powerhouse of protein and micro nutrients. Dried fenugreek leaves are also very high in antioxidants and help in lowering cholesterol. Heat a saucepan full of water on medium heat and boil the eggs for 10 minutes. Peel and set aside. 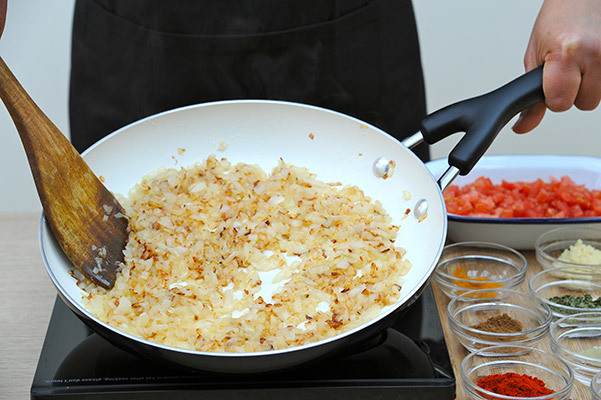 Now heat oil in a wide bottom pan and add the finely chopped onions. Keep frying on medium heat until they turn golden brown. Then add the ginger garlic paste and fry for a few minutes. Add tomatoes to the pan now and sprinkle a little salt over them. This will help dry up the water quickly. Once the oil starts separating, add coriander & cumin powder, turmeric and Kashmiri chilli at this stage. Once the masala starts leaving oil on the sides take it off the heat. 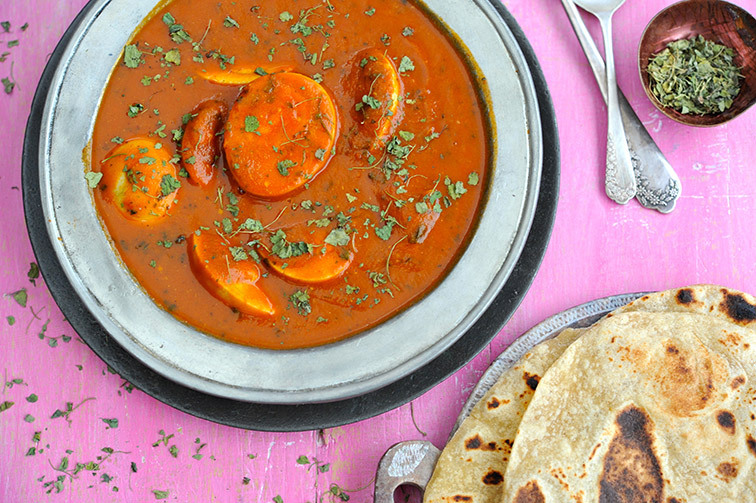 Blend this masala to form a smooth paste and set aside. Now add 1 tbsp. oil to the same pan and add a bay leaf and green chilli (split lengthwise). 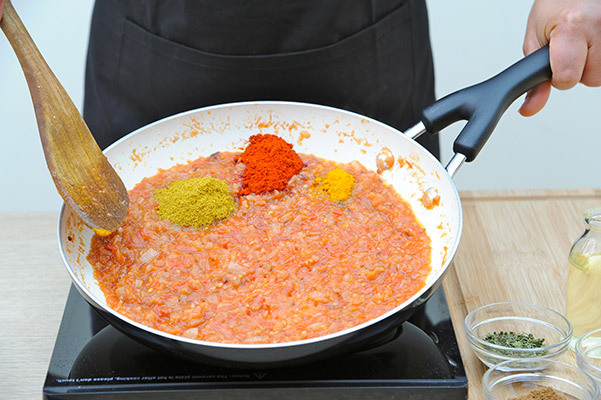 Once it starts to sizzle, add the blended masala and fry again until the oil leaves the sides. Now add the whole boiled eggs. 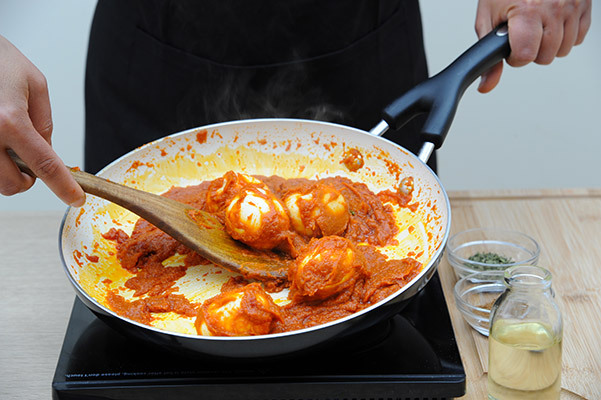 Fry eggs with the masala for a few minutes and remove them from the pan. Then add some boiled water to the pan and bring to a boil. 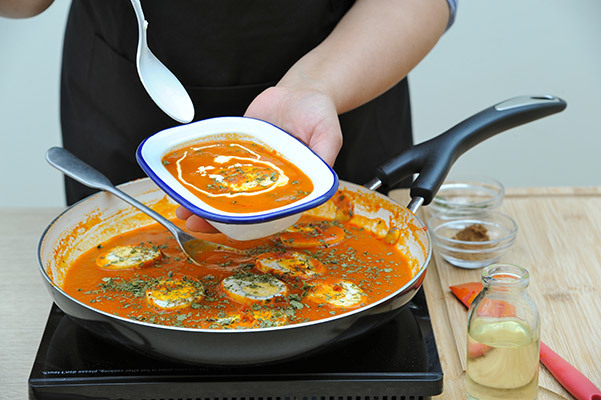 Slit the eggs into halves now and add to the pan so that they soak up the flavour of the curry. 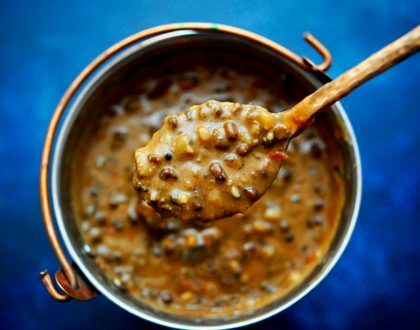 Add cream to the curry and garnish with garam masala, chopped coriander and dried fenugreek leaves. 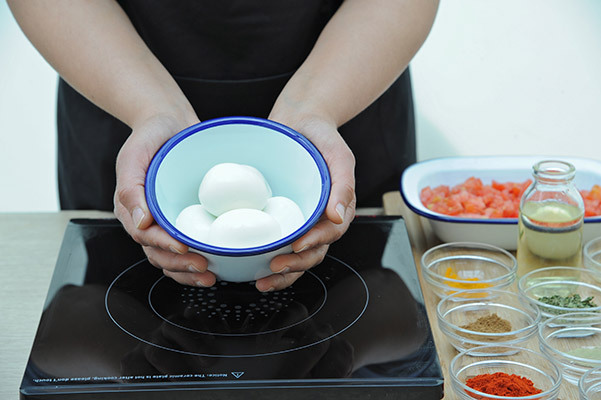 Once the eggs are boiled, place the pan full of eggs under cold running water. Peel the eggs as soon as they are cool to avoid having the membrane stick to the shell. 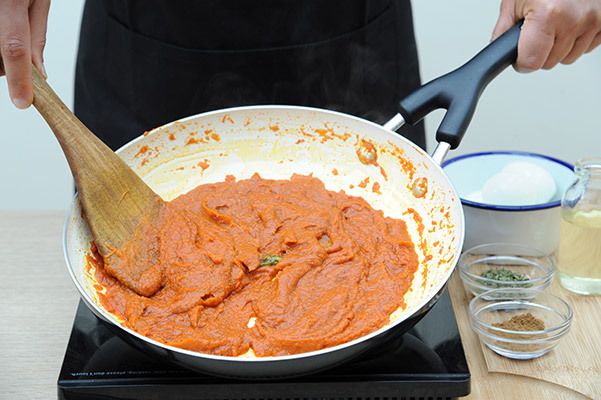 When adding tomatoes to the pan, sprinkling a little salt over them helps dry some excess liquid from the pan. Tried this recipe . Really easy to make and tasted great too👍Thanks Nidhi!